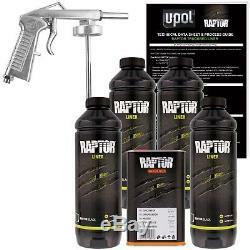 U-POL RAPTOR BED LINER KIT with APPLICATOR GUN. Great for bed protection and sound deadening! Sprays Truck Beds, Inner Fenders, Chassis, and more - Simply Fill, Shake, and Shoot! 1 - Liter of Activator. 4 - Liters of Tinable Raptor. 1 - UP0726 Spray Gun Protects and Sound Deadens. Inside Cars, Trunks & Fenders. Easy to Apply: Simply fill, shake, and shoot! Kit contains four bottles (each is 3/4 full) of bed liner material. Just add hardener to fill line, shake bottle, and spray on with applicator gun included. Apply with an even-sweeping motion to obtain the required texture. Bed liner can also be rolled or brushed to obtain different textures. The surface should be lightly sanded or scuffed and free of dirt and rust for proper adhesion. If bare metal is present, treat with U-Pol #8 Acid Primer before applying bed liner. SPECIFICATIONS: At 68°F - Pot Life is 60 minutes. Cure Time: touch dry < 1 hour subject to film buildup; Light-Duty Use: 2-3 days; Regular-Duty Use: 5-7 days. Coverage: 125 square feet (standard 8 ft bed). Additional coats can be applied after 60 minutes. One kit will cover up to a standard 8 ft truck bed or 125 square feet. Total kit makes 1.06 US gallons. Can Raptor be applied over rust? No, any rust must first be removed or coated with a rust encapsulating or rust converting coating like Por15, Zero Rust, IES1500 then RAPTOR can be applied. Can I tint Raptor and with what: Yes, activate as normal then add up to 100 ml or 10% of total mix with solvent base coat. 2k solid color can be used as well. What can RAPTOR be applied over: Properly prepared, Steel, Alu, Wood, OEM Paint, Plastics, Fibre Glass, SMC, and Concrete. Some priming or sealing maybe required, see technical data sheet. What do I use to for clean up or for gun cleaning: Acetone or lacquer thinner 5. Can RAPTOR be force dried: Yes, 60° (140°F) = 30 min 7. Application equipment: U-POL 0726 Gun (stonechip Gun) HVLP spraygun 1.7- 2.5, Roller, Brush. How many coats should I apply: Avg application is 2 3 coats. What is the Min-Max temperature RAPTOR can be applied: Min 5°(41°F) Max 35°(95°F) 10. What temperatures is RAPTOR resistant to: Constant Min -18° (0° F) Max + 100° (210°F) 11. What liquids is RAPTOR resistant to: Fresh & Salt Water, Petrol, diesel, Acids, Animal Urine (Further chemical resistance data available on request) 12. What is the pot life once RAPTOR is activated: 60 minutes 20° (68°F) 13. Can I re-apply RAPTOR over itself at a later date: Yes, appropriately cleaned & abraded 14. Can I over paint RAPTOR: Yes, once RAPTOR is fully cured appropriately cleaned & abraded 15. Smooth or textured finish / non-skid: texture is controlled by type of gun (Shultz gun or HVLP gravity), air pressure and distance from surface. Anti-Slip additive UP4800 can be added to activated product, amount depends on level of anti-slip required. Refer to UP4800 application sheet. What is the mixing and tinting ratio: Standard mix ratio is 3:1 and can be reduced with urethane reducer up to 20% if required. Tint ratio is 100 ml or 10% with solvent base coat per liter. What is the average build and coverage: Approx. The item "U-POL RAPTOR UP0821 TINTABLTruck Bed Liner Kit + 1 Spray Gun" is in sale since Wednesday, August 31, 2016. This item is in the category "eBay Motors\Automotive Tools & Supplies\Other Auto Tools & Supplies". The seller is "levineautomotive" and is located in Norwalk, Connecticut. This item can be shipped to United States. California Prop 65 Warning: WARNING: This product can expose you to chemicals including [ethylbenzene], which is known to the State of California to cause cancer and birth defects or other reproductive harm. For more information go to www.P65Warnings.ca.gov.